Dell's AMD-powered Latitude D531 is unlikely to win any awards for its looks. However, it does have a fast dual-core processor, 2GB of memory and a nice display plus Wi-Fi connectivity as standard, making for a versatile business notebook at an affordable price. The first thing you notice is the 15.4-inch display. On the downside this makes the D531 a little large to carry about, but with an ATI Radeon video controller and a resolution of 1,280 x 800, it's man enough for most day to day tasks. Moreover, specify a Dell TrueLife display (at a remarkably affordable £13 + VAT) and the resolution rises to an impressive 1,440 x 990 pixels. Either way the end result is a large, bright display plenty big enough for presentations, with a wide viewing angle and sufficient adjustment to deal with a range of lighting conditions. 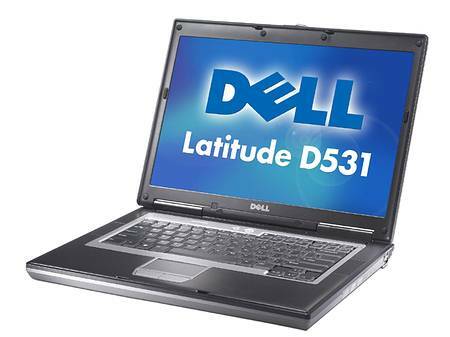 The Dell Latitude D531 isn't the fastest or sexiest laptop on the market, but it does deliver what business buyers crave most: configurability, long battery life, and good value. This six-pound mainstream portable is worth a look for corporations and growing businesses that appreciate a stable platform and common parts (battery, AC adapter, bay devices, and docking solutions for D531 are the same as for all the other D-series models) but are tired of paying north of $2,000 per machine for a decently equipped model. This business notebook provides good performance, durability, and security for the price, along with excellent battery life. My general impression of this notebook is neither wholly positive nor negative. It has little problems yes, but such things might be expected for a budget notebook you're paying $799 for. The build quality is good overall and better than many consumer notebooks, so you're getting a bargain there in terms of price. Disregarding the graininess issue, the screen quality was above average, having better viewing angles and brightness, compared to other business notebooks such as a ThinkPad T60 series.